Martin Whiteford Marion (December 1, 1917 – March 15, 2011) was an American professional baseball player and manager. He played as a shortstop in Major League Baseball from 1940 to 1953. 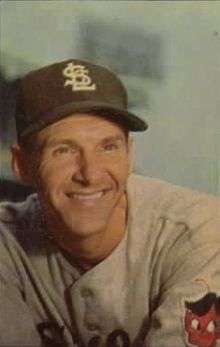 Marion played with the St. Louis Cardinals for the majority of his career before ending with the St. Louis Browns as a player-manager. He later became the manager of the Chicago White Sox. Marion was born in Richburg, South Carolina. He grew up in Atlanta, where he attended Tech High School and played baseball for the Georgia Tech Yellow Jackets. His older brother, Red Marion, was briefly an outfielder in the American League and a long-time manager in the minor leagues. Nicknamed "Slats", Marion had unusually long arms which reached for grounders like tentacles, prompting sportwriters to call him "The Octopus". From 1940-50, Marion led the National League shortstops in fielding percentage four times, despite several other players being moved around the infield during these years. In 1941 he played all 154 games at shortstop (also a league-high) and in 1947 he made only 15 errors for a consistent .981 percentage. Marion was also a better-than-average hitter for a shortstop. His most productive season came in 1942, when he hit .276 with a league-leading 38 doubles. In the 1942 World Series, one of four series in which he participated with the Cardinals, he helped his team to a World Championship. In 1943 he batted a career-high .280 in the regular season and hit .357 in the 1943 World Series. He played with many second basemen throughout his career, including Frank "Creepy" Crespi. Marion commented after the '41 season that Crespi's play was the best he ever saw by a second baseman. Crespi once took on Joe Medwick on the field (during a game) when he was trying to intimidate Marion. They remained friends until Crespi's death in 1990. In 1951 Marion managed the Cardinals and was replaced by Eddie Stanky at the end of the season. He moved to the American League Browns and took over for manager Rogers Hornsby early in 1952 as their player-manager. The last manager in St. Louis Browns history, he was let go after the 1953 season when the Browns moved to Baltimore. He then signed as a coach for the White Sox for the 1954 campaign and was promoted to manager that September, when skipper Paul Richards left Chicago to become field manager and general manager in Baltimore. Marion led the White Sox for two and half seasons, finishing third each time, before he stepped down at the end of the 1956 season. In 1958, Marion purchased the Double-A minor league Houston Buffaloes from the St. Louis Cardinals, and successfully moved the team to the Triple-A level under the Chicago Cubs farm system. He later sold the team to a group led by William Hopkins on August 16, 1960. Hopkins then sold the team to the Houston Sports Association led by Roy Hofheinz who had obtained a major league franchise in the National League which became the Houston Astros. In a 13-season career, Marion posted a .263 batting average with 36 home runs and 624 RBI in 1572 games. He made All-Star Game appearances from 1943–44 and 1946–1950 (There was no All-Star Game in 1945). In 1944 he earned the National League Most Valuable Player Award. As a manager, he compiled a 356-372 record. Marion died of an apparent heart attack on March 15, 2011. He lived in Ladue, Missouri. 1 2 "'Mr. Shortstop' Marty Marion dies". St. Louis Post-Dispatch. March 17, 2011. ↑ Goldstein, Richard. "Marty Marion, Cardinals's Slick-Fielding Shortstop, Dies at 93". New York Times. Retrieved 11 August 2014. ↑ Asher, Gene. "School of Champions". GeorgiaTrend. GeorgiaTrend. Retrieved 11 August 2014. ↑ "Marion Gets Lumps as Front Office Man". Milwaukee Journal Sentinel. 1960-03-22. Retrieved 2013-03-25. ↑ "Buffs President Marion Sells Stock, Bows Out". St. Petersburg Times. August 17, 1960. p. 3-C.
↑ "Houston Will Get Emphasis, Paul Declares". Observer–Reporter. 1961-01-19. Retrieved 2013-03-25. ↑ "Marty Marion dies; shortstop was MVP with '44 Cards". St. Louis Post-Dispatch. March 16, 2011.